Please note that a warmblood does not have to be purebred to get registered with a studbook. E.g. a Holstein x Hanoverian can still be registered as either breed, just as long as they show the breed's characteristics. IMEHA 2015 - onwards: Holds 214 IMEHA points in Halter, 1x Division Reserve Champion (OF Breed), Dam of IMEHA Top Placing colt Idolic. IPABRA: Nationals Qualified, Nationals Top Placed (OF Plastic Mare Gender & OF Riding Type Sport Breed). IPABRA 2013 Nationals Reserve Champion Mare (OF Division). Vogue is a very nicely bred mare. Sired by Littorio, a promising stallion and sire of many winners. He's a son of the influential sire Lord, who is famous for siring successful jumpers and hunters. His sire, Ladykiller, a Thoroughbred, was not very succesful as a racer for he was far too heavily built. So instead, he was retired from the track and sent to a studfarm where he would be used to refine the Holstein breed. Ladykiller carries lines to Fairway and Gainsborough (through Hyperion). Vogue's dam is Tiuna Princess, a beautiful grey mare sired by Ramino II, one of the best sons of the international showjumping champion Ramiro Z. He is arguably the most influential sporting sire of all time. His maternal grandsire is the Thoroughbred Cottage Son, the most influential sire of Holsteins for military purpose. Vogue's maternal granddam is Manila, a descendant of famous sire Farnese. Vogue is dual registered as a Holstein and a Hanoverian with the Modelpferde Hannoveraner Verband (MHV), and with the Model Horse Warmblood Registry (MWR) as a Holstein with Star Status. She can produce foals of either breed. So far Vogue has already produced some outstanding colts (including IMEHA Top Placing WB Colt, Idolic) eligible for Elite Status within MHV and MWR. Available for breeding to all Warmblood and Thoroughbred stallions. Prefer foals of good type, but BSO ok. Purebred Holstein colts must have names beginning with the same letter as their sire's name. Please check open foaling years below. 2010: SMS Idolic (x SMS Idocus). 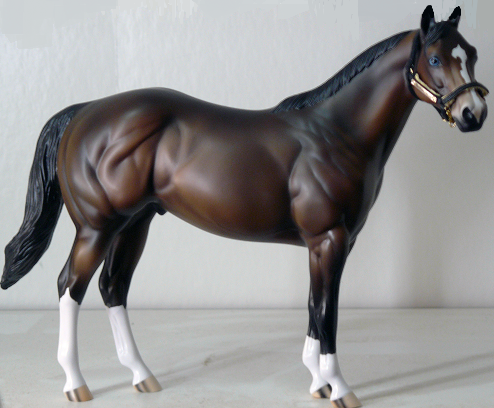 Bay Holstein stallion. O/B: Silver-Moon Studfarm ABMHA multi Champion & 2013 Overall Year Champion of Headstudy, Colt Gender. Currently holds 350+ IMEHA points in Halter. Zucchini is a very agile and beautiful mare. With her refined head and body, she is perfectly fit for what Dutch Warmbloods do best - compete. Zucchini is by Pine Tree Stables' beautiful stallion PS Tobago, who has had great success in showjumping. Tobago is by the KWPN stallion Nairobi, whose sire Lauriston was a German Showjumping Champion in 1992. Nairobi's lines also include Landgraf I, Uppercut and Graphit. PS Tobago's dam was O'Kristy, a KWPN mare by the very good sire Colino. Her lines include the great jumpers Capitol I and Cor De La Bryere. Zucchini is out of our own Holstein mare, SMS Vogue. Vogue has been a great success on all fronts, including halter shows, dressage competition and as a broodmare. With Zucchini we hope to continue her influence in the Warmblood lines. Vogue's sire was Littorio, a son of the very successful 3-day eventer, Lord. Lord sired many international showjumping champions, and he was known for passing on his very good conformation. Vogue is out of Tiuna Princess, who has lines to another fantastic showjumper, Ramiro Z. We expect Zucchini to follow in her dam's hoofprints. She will become a valuable asset in our breeding program. Available for breeding to all Warmblood and Thoroughbred stallions. Other breeds considered upon request. The Dutch Warmblood registry (KWPN) has fixed letters to name foals born in certain years. A list of all those can be found here. 2010 - F, 2011 - G, 2012 - H, 2013 - I, etc. Please check open foaling years below. This mare is of impeccable breeding. She combines the legendary Samber, Nimmerdor and Argentinus in a spectacular pedigree. Alouette is by the KWPN approved stallion Umenno, who has sired many KWPN Premium horses and champions. He is a grandson of KWPN Stallion Of The Century, Nimmerdor. Through his granddam Patty, Umenno also carries a line to the Thoroughbred stallion Lucky Boy, who has contributed to improve Dutch Warmblood breeding by producing a string op top showjumpers on the international scene. Umenno's dam Evelien was a pinto KWPN mare sired by Samber, who was the first pinto coloured stallion to be approved by the KWPN Studbook. Allouette's dam is the KWPN mare Allergirl, a daughter of Argentinus, a Hanoverian. Argentinus earned the 2005 Hanoverian Stallion Of The Year title. He led the statistics for the amount of prize money earned by his offspring for an astounding seven years! Although Argentinus himself was a very successful showjumper, his progeny have proven themselves in both the international showjumping and dressage scenes. Argentinus is by the 1994 Hanoverian Stallion Of The Year, Argentan. Allergirl also carries a line Bolero through her dam Babsi. Further lines include Duden II and Grande. Alouette makes an excellent ourcross on the usual jumper lines in our breeding program.